On February 16, 2011, at 2320 hours, the victim’s department and a mutual aid department were dispatched to a structure fire at a three-story 12,500 square foot, single family dwelling located on a hillside. Fire was observed on an exterior wall upon arrival. Additional fire was discovered within an interior wall that extended into a drop ceiling void space and into an attic. At 0003 hours (February 17, 2011), a 61-year-old male career fire fighter/paramedic (the victim) and several other career fire fighters were injured when a large section of the 1st floor interior ceiling suddenly collapsed onto them while they were attempting to gain access to the fire above them. Emergency traffic over the radio was immediately transmitted and the fire fighters and officers were quickly rescued from under the debris and treated. The victim succumbed to his injuries on February 18, 2011. The injured fire fighters and officers were treated for non-life threatening injuries. B-side of house following the fire. Homeowners, contractors, and governing municipalities should ensure compliance with current building and fire codes within their jurisdiction. Collapsed ceiling within house where victim and fire fighters were found. In the early morning hours of Thursday, February 17, 2011, a 61-year-old male career fire fighter/paramedic (the victim) and twelve other career fire fighters/officers were injured when a large section of the 1st floor interior ceiling suddenly collapsed onto them while they were attempting to gain access to an attic fire. Unfortunately, the victim succumbed to his injuries the next day. On February 23, 2011, the U.S. Fire Administration notified the National Institute for Occupational Safety and Health (NIOSH) of this incident. On February 27 – March 4, 2011, a safety and occupational health specialist and a general engineer from the NIOSH Fire Fighter Fatality Investigation and Prevention Program traveled to California to investigate this incident. On March 3, 2011, during the on-site investigation, the city district attorney requested that NIOSH suspend their investigation activities due to an on-going criminal investigation of the fire. The NIOSH investigators did have an opportunity to meet with the fire chief and representatives from the local fire fighters’ union; the fire department’s training and maintenance division, department’s arson unit, and Special Incident Investigation Team; and the city’s personnel department (medical services division), building and safety department, and 9-1-1 center. Prior to the suspension of the NIOSH investigation, interviews were conducted with some members of the victim’s department and the mutual aid department directly involved with the incident and with representatives from the city’s medical services division. NIOSH investigators were not able to interview the incident commander for the incident. The NIOSH investigators were able to visit, document, and photograph the fire scene and structure from the exterior. The NIOSH investigators also reviewed the victim’s department medical file, annual respirator fit testing records, and self-contained breathing apparatus (SCBA) maintenance records. The NIOSH investigators also reviewed dispatch radio transcripts, photos from the incident scene, department guidelines and standard operating procedures (SOPs), some fire department previously recorded fire fighter interviews (some not audible or playable), and an initial list (incomplete) of completed training hours for the victim. NIOSH was not able to obtain training records for the incident commander (IC) prior to the investigation being suspended. The victim’s SCBA was inspected and photographed. NIOSH investigators also met with representatives from the SCBA manufacturer to retrieve data contained on the victim’s personal alert safety system (PASS) device data logger. The victim’s personal protective equipment was not available for review by NIOSH investigators. On April 10, 2012, the city’s district attorney provided NIOSH with the coroner’s report, the fire consultant’s investigative report, and the fire department’s fire investigation report. At this time, NIOSH was allowed to incorporate this additional information within its’ investigative report. At the time of this incident, this career fire department had 106 stations with 3,588 uniformed members serving a population of over 4,000,000 within an area of about 470 square miles. Due to economic constraints, the fire department used a modified coverage plan which reduced staffing by 122 positions per shift. All department members worked a 24-hour duty shift for 3 out of 9 days or an average of 56 hours per week. In 2010, the fire department responded to nearly 15,000 actual fire incidents with 90% of the responses on-scene in less than 5 minutes. At the time of the incident, the fire department had 127 ambulances, 101 engines, 49 trucks, 15 brush apparatus, 4 foam tenders, 4 rehab air tenders, 2 fuel tenders, 1 heavy rescue apparatus, 5 marine boats, 2 emergency lighting units, and 6 helicopters. Specialty units consisted of swift water rescue teams, airport companies, hazardous material squads, bicycle medic teams and urban search and rescue companies. All fire department apparatus were maintained by the city’s fleet maintenance division with annual testing of fire apparatus and ambulances conducted by qualified vendors. All advanced life support ambulances were staffed by the fire department. Insufficient information was available for this section at the time of the final report. Note: See Diagram 1 for incident scene. Diagram 1. An aerial view of initial arriving units to the incident. This timeline is provided to set out, to the extent possible, the sequence of events according to recorded and intelligible radio transmissions on multiple channels (CH 9 and CH 12). Times are approximate and were obtained from review of the dispatch records, witness interviews, and other available information. Times have been rounded to the nearest minute. NIOSH investigators have attempted to include all intelligible radio transmissions, but some may be missing. This timeline is not intended, nor should it be used, as a formal record of events. 911 call received by dispatch for a house across the street on fire. The caller stated fire and black smoke were visible. E41, R41, E97, R97, LF27, LF78, EMS5, B18 were dispatched for a structure fire and were assigned tactical channel 12 (CH 12). E41, E97, and LF27 en route. Dispatch notified mutual aid dispatch center by land line that an engine from their department was needed on the initial response. R41, LF78, MAE7, and B18 en route. R97 and EMS5 en route. On CH 9, E41 reported a two-story, single-family dwelling with fire showing on the outside of the structure; dispatch acknowledged. LF27 and MAE7 on scene. Note: All subsequent radio traffic was transmitted on CH 12 unless otherwise noted. B18 on scene and took command. The IC asked E41 to give him a better size-up of the incident. The IC stated, “Roger, give me an idea if we need some more resources or not.” E41 acknowledged. The IC acknowledged this transmission and asked T27 if they had a hoseline. The IC acknowledged this transmission and advised T27 that MAE7 was on scene. The IC called E97 to see if they were on scene yet; E97 advised the IC they would be on scene in about two minutes. E41 advised the IC that the outside fire was out and it looks like we have fire in the attic. The IC asked E41 if they would be able to attack the fire interiorly; E41 advised yes. E97 on scene. The IC advised E97 that they would be handling backup fire attack with E41 and that they may need to assist with forcible entry. T27 advised the IC that E41 had made entry into the house and that E97 could grab a second hoseline from E41. The IC and E97 acknowledged this transmission. The IC attached R97 as part of E97’s fire attack crew; R41 assigned as the medical unit. The IC advised LF78 (while they were still en route) that when they arrived on scene they would be taking control of Division A with E41, E97, R97, and LF78 members on the interior. E41 asked T27 if they could bring them pike poles. E41 asked for longer pike poles (noted small area of fire, possibly in ceiling) and salvage operations interiorly. The IC acknowledged and advised E41 that E97 and R97 were working inside with his E41 members. R97 retrieved longer pike poles. On CH 9, IC advised dispatch that what they had on scene was an outside fire that had extended into the inside and that they could handle the incident with available resources on scene. The IC contacted E41 to verify if all the occupants were out of the house; E97 confirmed all occupants were out. T27 advised the IC that they had no additional exposures and a hole had been opened on the roof. E41 asked for longer pike poles and a ladder after finding fire within the walls. E41 advised they had a good shot at reaching the fire with their hoseline interiorly. The IC confirmed with E41whether or not MAE7 was inside; E41 confirmed and advised him that E41, E97, and MAE7 were interior. The IC advised E41 that he needed to use someone from his interior operation to go retrieve additional pike poles; E41 advised the IC that the pike poles were taken care of. E41 advised the IC that the house had two subterranean levels not involved with fire, they would need assistance with salvage, and the bulk of the fire was at the street level (first floor); the IC acknowledged and designated the fire floor as “Floor 1” with two basement floors. E41 advised the IC that they were trying to get water on the fire because they had discovered fire running between the walls on the 1st floor; the IC acknowledged. On CH 9, dispatch advised the IC that he had hit the 15-minute mark on his timer; the IC acknowledged. T27 advised E41 that they noticed no change in fire conditions from interior operations; E41 acknowledged this transmission and advised T27 that they still had a fair amount of fire in the walls. The IC advised LF78 to handle all interior work related to breaching walls and salvage operations; LF78 acknowledged. E41 contacted T27 twice to find out how their roof operation was going. T27 advised E41 that they had no effects at all and the fire was moving south in the attic. The IC advised LF78 that their crew would be working inside with E41, E97, R97, and MAE7 under their command; LF78 acknowledged. DC2 notified of working fire. T27 asked the IC if he had another truck company to assist with roof operations on the opposite side of where T27 was working. The IC advised T27 that LF78 had been assigned to do interior truck work and to verify if he needed additional truck company for roof operations; no response from T27. T27 contacted E41 to check on their interior operation; no reply. The IC asked T27 to give him a “CAN report” for the roof. T27 advised the IC that they were continuing to expand the hole, had not seen much change, the fire appeared to be moving south along the roof, and they could see no effects from interior operations. The IC acknowledged T27’s traffic and advised T27 that LF78 was going to assist with interior operations to open up the walls (some personnel were also sent to the roof). The IC also asked if he had any exposures, vegetation, or structures threatened at this time. E41 advised the IC that the fire was contained inside (running between the walls) with no exposures; the IC acknowledged. On CH 9, DC2 requested another “BC” for the incident; dispatch acknowledged. Division A requested 20-foot extension ladders if personnel were available to bring them; the IC advised Division A that he had to use his available staff to retrieve the ladders. E97 advised the IC that they had extinguished all the fire that was located within the walls on the D-side and that they were reassigning themselves with E41. E41 (from Floor 1) advised the IC they had fire running through the attic and they were getting lines in place. The IC advised E41 to report to LF78 (which was Division A). The IC advised Division A to make sure all the ceiling was pulled because it sounded like there was fire running through the attic and they had crews working above to assist with getting this fire out. Division A advised the IC that, when he received more companies on scene, he was going to request them to pull ceilings; the IC acknowledged. An unknown unit requested more pike poles; another unit advised him they had them. On CH 9, the IC requested an additional Task Force; dispatch acknowledged. On CH 9, LF20 and E61 are dispatched to the incident. E41 requested additional personnel from the IC to pull ceilings; the IC acknowledged. The IC advised “medical” to move up (personnel were on foot) to the residence across from E97 (across from house on fire); R41 acknowledged. Division A advised “roof operations” they were looking better interiorly, but wanted to know how the fire was moving on the roof; T27 advised him they saw very little fire and they were leaving the roof to change out air bottles. T27 also advised Division A that the truck company working on the north end of the building had just opened up the roof and that he could see fire coming from it; Division A tried to verify the exact location in relation to the interior operations, but could not. On CH 9, dispatch advised the IC that he had reached 30 minutes on his incident clock; IC acknowledged. The “interior” contacted the “roof” to see if they had a handle on the fire located in the north area of the roof; the IC contacted Division A twice to see if they were able to get a line on this fire (fire coming from the north side of the roof) from the interior; Division A advised the IC that they were doing a lot of ceiling pulling, trying to get to the seat of the fire. The IC acknowledged Division A’s transmission and asked T27 if they needed a line on the roof; Division A advised the IC to send a line to the roof to get the fire knocked down. A T27 unit advised the IC that they were off the roof (changing air bottles) and that T78 was still on the roof; the IC asked T78 if they could use a line. Division A contacted the IC and tried to have a conversation (about the roof collapse) but was walked on by other units. On CH 11, MABC1 stated, “Command from Division 1, we had a ceiling collapse…a ceiling collapse on Division 1. We’re taking a PAR.” MABC1 repeated his traffic and the IC acknowledged. E61 advised the IC they were on scene but there was no response from the IC. Division A called the IC again but there was no response from the IC. Division A contacted the IC again and stated, “ Talk to me on 11, I’ve got emergency traffic, emergency traffic, emergency traffic, fire fighters down, there are fire fighters trapped, we are doing a self-extrication right now, we are gonna give you a PAR and a CAR shortly. On CH 11, MABC1 stated, “We need chain saws ASAP…fire fighters trapped in Division 1”; the IC acknowledged and advised him that personnel were coming. LF20 marks on scene and advised the IC they were going up with E61; the IC acknowledged. T27 advised the IC that they were going to go interior to help with the fire fighter rescue. On CH 9, dispatch advised the IC that an emergency trigger was activated for the hydrant man from E41. Division A contacted the IC twice without a response. On CH 9, the IC requested two advanced life support RAs or ambulances for the scene. On CH 11, the IC advised Division A that two RAs had been requested and that E61 was coming in as the RIC. On CH 9, R27, R78, and EMS18 were dispatched to the incident. Battalion 18 advised the IC that the E41 member (the captain) was found and accounted for. The IC advised E61 that he was sending in LF20 to assist with the extrication of the trapped fire fighters. T27 advised the IC that the fire fighter they were looking for was the victim from E97. R27 en route. The E41 captain advised the IC that his right leg may be broken; the IC copied and advised E41 that he had sent resources in to help him and the IC asked for his location; E41 captain advised the IC that he was not inside the structure but was outside; the IC confirmed that all E41 crew members were out and that rescue was available to assist him. On CH 9, DC2 arrived on scene and took over command and requested additional units. On CH 9, dispatch advised the IC that his additional units en route to him were LF61, E89, and BC9; he acknowledged and requested an additional ambulance. E61 advised the IC that all personnel from E41 were accounted for. On CH 9, the IC requested an urban search and rescue team for the incident. The victim is discovered within the debris. LF20 prepared to bring out the victim. The victim was removed from the structure. On CH 9, dispatch advised the IC he was 45 minutes into his incident clock. All personnel had been removed from the structure. Victim was transported to the hospital. It was reported to NIOSH investigators that the victim entered the structure wearing a full array of personal protective clothing and equipment, consisting of turnout gear (coat and pants), helmet, gloves, boots, and a SCBA with an integrated PASS device, Nomex® hood and helmet. The victim’s facepiece was properly connected to his regulator and was reported to be appropriately positioned about the face of the victim prior to and after the collapse. The victim’s SCBA was evaluated by the NIOSH National Personal Protective Technology Laboratory (NPPTL) to determine conformity to the NIOSH-approved configuration (see Appendix). During the NIOSH investigation, information contained in the PASS device data logger was also downloaded with the assistance from the SCBA manufacturer (see Appendix). Note: The data logger received internal damage that resulted in the data logger resetting to the manufacturer’s original date and time settings. The data contained on the data logger could not be used to verify its operation the day of the incident. The victim’s structural fire fighting ensemble was not evaluated. Due to an open investigation by law enforcement and the city’s arson unit, NIOSH investigators were not granted access into the house; however NIOSH investigators were allowed to photograph the exterior. Information contained in this section was obtained through fire department interviews, investigative reports from the fire department and the city’s hired fire consultant (provided from the city’s district attorney), and photos provided to NIOSH from the mutual aid fire department. The fire occurred in a newly constructed and occupied (February 2011) three-story, single-family dwelling located on a hillside (see Photo 1). The home had approximately 12,500 square feet divided among the three floors. The first floor (see Diagram 2), located at street level (main entrance and where collapse occurred), was constructed of steel and 2-inch by 6-inch wood stud framing with 6-inch flat wood siding. The remaining two floors, which were below grade, were constructed of concrete. The conventional double-layered, flat roof construction consisted of a fiberglass reinforced membrane affixed to an insulation board that was fastened to a ¾-inch plywood roof deck with mechanical fasteners. Tapered 2-inch by 6-inch lumber was framed below the ¾-inch plywood roof deck to create a slope to assist with drainage off the roof. Below this, the second layer of the roof was also constructed with ¾-inch plywood, which was fastened beneath the tapered 2-inch by 6-inch lumber and on top of 2-inch by 12-inch rafters (see Photo 2 and Photo 3). Photo 1. 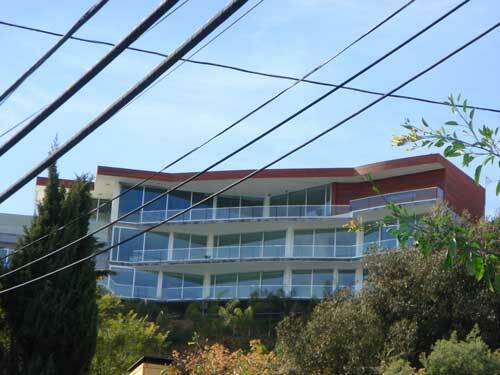 Photo taken from a neighborhood street below the residence showing the B-side of the structure, which was not accessible or able to be viewed from street level. Diagram 2. Layout of first floor where fire fighters were working prior to the collapse. Photo 2. Photo shows roof construction and materials. Photo shows ventilation hole cut above the collapse area by the fire department the night of the incident. Photo 3. Photo shows the layers associated with constructing the home’s roof membrane. The first-floor dropped ceiling comprised of a large unsupported open space was nailed to the 2-inch by 12-inch rafters (running north/south). Hanging down from the rafters were 2-inch by 4-inch wood hangers measuring approximately 26 inches in length that were attached to every third rafter east/west and every 5 feet north/south. Additional 2-inch by 4-inch wood boards were then nailed to the bottom of the hangers. These boards ran east/west spanning the ceiling in the living room and were 5 feet apart. Attached to the bottom of those boards were 2-inch by 4-inch boards approximately 16 inches apart running north/south and running the length of the living and dining room ceiling. Note: Photo 4 shows a close-up for the ceiling construction. Then ⅝-inch type “X” fire code drywall was attached to these boards, and then finished with smooth plaster (see Photo 5). The drop ceiling created an approximate 28-inch void space between the underside of the roof decking and the ceiling drywall, where 6-inch thick R-23 insulation, plastic sprinkler piping, electrical conduit, and air conditioning duct work was placed (see Photo 6). Photo 4. Close up of ceiling construction. Photo 5. Photo shows ceiling construction of the drop ceiling where the collapsed occurred. Photo 6. Photo shows void spaces between rafters. A typical ⅝-inch-thick sheet of drywall that is 4 feet by 8 feet weighs approximately 70 pounds (2.2 pounds per square foot); ⅝-inch drywall is also sold in larger sheets as wide as 4½ feet or as long as 16 feet (application and use dependent), making a single sheet of drywall weigh as much as 140 pounds or more. Including the weight of multiple sheets, the compromised structural support system, ceiling fixtures (e.g., fans, lights), insulation, and water from suppression activities resulted in making a potential collapse weight in upward of 1,000 pounds or more. According to the fire department’s fire investigation report, the portion of the wide area ceiling which collapsed onto fire fighters measured approximately 27 feet by 45 feet (1,250 square feet). The ceiling height was approximately 11 feet, 3 inches where the collapse occurred. The living room also contained a recessed fire place measuring approximately 18 feet wide by 2 feet deep by 18 inches in height. The fire place enclosure was constructed of drywall, backer board, and tile. The back wall was backer board and covered with tile. The top and side walls were constructed of drywall and the floor was constructed with backer board. Within the fire place enclosure was a gas-burning appliance. Within the floor of the fire place were two stainless steel troughs measuring 6 inches by 15 feet that contained two ½-inch pipes connected to two blowout boxes (north and south ends of fire place). The pipes and troughs were covered with dark colored glass chips and lava rocks. In the void space below the fire place floor were two control boxes (north and south ends of fire place) that were rated for 300,000 BTUs each. Note. Fire was first observed by arriving units on the D-side exterior wall of the house in area of north blowout/control boxes (see Diagram 1 ). Above the fire place was a void space that extended up into the ceiling (area of collapse). This void space measured approximately 2 feet deep by 20 feet wide and was constructed of 2-inch by 4-inch sawn wood and then enclosed with drywall. Within the void space were three, 4-inch diameter sheet metal vent ducts above the fire place that connected to a single vent duct that appeared to lead to the roof. Photo 7 and Photo 8 show construction of the gas fire place and void space. There were no observed draft or fire stops at the top of the void space below the roof. Note: Specifics of the gas fire place were obtained from investigative reports provided to NIOSH investigators from the city’s district attorney. The fire places within the home did not have a permit and were never inspected prior to use. The home did contain a residential sprinkler system. According to information provided to NIOSH investigators and through interviews conducted, it appeared that none of the systems’ sprinkler heads activated during the incident. However, the homeowner did awake to water flowing down the first floor stairs from what is believed to have been from the sprinkler system. Interior fire fighters noted water coming from ceiling canister lights and down the walls. It is believed that the plastic sprinkler pipes may have been exposed to fire damage once the fire spread into the attic area. Note: Additional information and inspection of the type and span of sprinkler system was not accessible to NIOSH investigators. Applicable building codes related to this incident may have included City Municipal Building Codes, International Building Codes, Residential Building Codes, Uniform Mechanical Code, International Fire Code, Uniform Fire Code, International Fuel Gas Code and International Mechanical Code. Photo 7. Picture shows the recessed gas fire place and opened void space above the fire place where some fire was discovered. Photo 8. Photo taken of another recessed gas fire place within the house which is believed to be similar in construction. The incident occurred during the night within a hillside single-family, residential structure. The temperature outside was in the upper 40s with a slight wind at 7 miles per hour from the south/southwest. On February 16, 2011, at 2320 hours, the victim’s department and a mutual aid department were dispatched to a structure fire at a three-story, single-family dwelling located on a hillside. At 2329 hours, E41 arrived on scene and positioned the apparatus on the D-side of the structure. Fire was visible on the D-side exterior wall of the home, which was transmitted over the radio to incoming units as the initial size-up (see Photo 9). Photo 9. Photo shows burn pattern where fire was first observed by first arriving units. Photo taken after the incident was under control. E41 also advised incoming units that it was a two-story structure. Note: From the A-side of the structure only a single-story home was visible, but two stories were visible from the D-side of the structure. However, the B-side, which could not be viewed or accessed due to the steep hillside, showed that the structure was actually three stories. To establish a water supply, E41 hand laid 150 feet of 4-inch diameter supply hose to a hydrant that was located on the A-side of the structure across the street from the main entrance into the home. E41 was able to quickly contain the exterior fire on the D-side wall by using a 1-inch hoseline from E41. E41 also placed a 20-foot extension ladder on the D-side giving them access to the home’s patio area (C-side), which allowed them to place a 1½-inch hoseline (200 feet of hose) to the C-side. At 2330 hours, LF27 (T27 and E227), MAE7, and R41 arrived on scene and positioned their apparatus on the A-side of the structure. The captain of T27 was the initial IC until B18 arrived on scene at 2331 hours and took over as the IC. The IC remained in his vehicle which was positioned behind MAE7. MAE7 reported that they saw a glow of fire emanating from the roof. MAE7 was immediately met by the homeowner who advised them that he heard water flowing inside the structure and that he needed someone to turn the water off because it was collecting on the floor below (the first floor below the street level). Members from MAE7 reported that there was little to no smoke within the structure, and that it did not appear that the fire sprinklers had activated, but there was water flowing from light fixtures (C/D corner) and from drywall in some areas. Note: It was later confirmed by interior crews that the fire sprinkler heads neither activated nor discharged any water. E41 advised the IC that they would give an interior size-up after they had breached several sliding glass doors and advanced their 1½-inch hoseline into the 1st floor of the structure. Members from T27 positioned two additional ladders (20-foot and 24-foot straight ladders) on the D-side of the structure giving them access to the roof. One member from T27 assisted E41 while the captain of T27 and the remaining three members became the initial roof crew. At 2334 hours, E41 reported that the D-side exterior fire was out, but it appeared that the fire had extended into the attic. The T27 roof crew observed fire coming from a roof ventilator, immediately began cutting a ventilation hole, and observed large amounts of fire under them (within the attic space). E97 had also arrived on scene and was ordered by the IC to back up the interior fire attack with a second hoseline and assist with forcible entry. E97, with four members (including the victim), grabbed a 1¾-inch hoseline (from E227), a thermal imaging camera, and pike poles before entering the structure at street level. In the living room area (C/D corner), interior crews discovered fire within the interior walls (D-side) behind/above a recessed gas fire place and drop ceiling (collapse area) void space (see Photo 7 ). At some point, water was no longer observed coming from walls or light fixtures. Note: The sprinkler system was turned off by the homeowner after units arrived on scene. At 2336 hours, the IC assigned R97 to E97 to assist with interior fire attack. MAE7 positioned a second 1¾-inch hoseline through the front door and into the 1st floor to assist with fire attack. Interior crews continued to work on opening up walls and attempting to pull the ceiling within the living room at the C/D corner. Note: The drop ceiling was approximately 11 feet above the fire fighters in areas causing much difficulty in reaching and pulling with a 6-foot pike pole. Longer pike poles and ladders had to be retrieved in order to reach the ceiling. Once longer pike poles were retrieved and put in use, the fire fighters still had difficulty pulling the ceilings due to the thickness of the drywall. The fire fighters stated to NIOSH investigators that it took several punches to poke through the drywall to only remove small pieces of drywall at a time. This process continued for the next 30 minutes until the ceiling collapse occurred. T27 continued roof operations directly over where the interior crews were working with their hoselines. Conditions worsened, causing the roof operations crew to go on air before extending their roof cuts. The chain saws were bogged down by the heavy, thick smoke to the extent that the saw’s air cleaners had to be removed. The roof structure proved to be troublesome and time consuming to ventilate due to the many layers associated with its construction. When areas of the roof were opened, heavy fire was observed in the exposed attic space. At 2342 hours, MABC1 arrived on scene and took charge of Division A operations after speaking with the IC and observing the exterior of the structure. MABC1 met with the officers of E41, E97, and MAE7 to get an update on their operation. At this time, the walls and small areas of the ceiling were opened allowing fire fighters to spray water on the fire in those areas. This information was passed on to the IC. Also, E41 advised the IC that the structure was actually a three-story structure (1st floor at street level and two additional subterranean floors). Personnel were requested from the IC to handle salvage operations. The IC directed LF78 upon their arrival (E78 and T278) to assist with salvage operations and any additional interior operations. LF78 copied the IC’s transmission. At 2347 hours, T27 requested an additional truck company to assist them with roof operations (to handle the A/B coroner). T27 was still having difficulty knocking down the fire and wanted to make sure that it did not spread. Four members from LF78 were assigned to assist with roof operations while the remaining members remained assigned to interior operations. They used ladders that were positioned at the A/B corner to access the roof, and began their roof operation in that area. At 2348 hours, the IC requested a “conditions, actions, and needs” report, or CAN, from T27. T27 advised the IC that they still had trouble expanding their roof hole and getting water on the fire. It also appeared to them that the fire was continuing to move under them, toward the C/D corner. They also had not noticed any obvious changes in conditions from interior suppression operations. At 2351 hours, MABC1 confirmed that the fire in the C/D walls was contained and that the fire was only in the attic now. Several interior crew members requested additional personnel from the IC to assist with pulling down the ceiling, but none were initially available until the IC called for an additional task force at 2354 hours. At 2357 hours, interior operations advised T27 that interior conditions were better and wanted to know how the roof operation was coming and where they saw fire. Radioed transmissions continued for the next five minutes between interior operations and roof operations on how to contain the fire, which was now in the attic. The T27 crew had to exit the roof to change air bottles and advised interior operations to speak with members of T78 to get a better idea of how the fire was moving. At 0002 hours, a large section of the drop ceiling fell on the interior crews while they were attempting to pull the drywall down from the ceiling. Emergency traffic from several interior fire department members was immediately initiated. The ceiling came down as a single piece that included drywall, water saturated insulation, lumber, and other structural material (see Photo 10). Many fire fighters were struck by or buried by the debris. Most were able to self-extricate, but three interior crew members, including the victim, required extensive extrication through the use of saws. Photo 10. Photo shows the span of ceiling and debris that collapsed onto the interior fire fighters. The engineer from E227 quickly exited the structure and sounded the evacuation horn on E227. E61, who had just arrived on scene at 0003 hours, was assigned as the rapid intervention crew (RIC). They had to walk up the hill from where they had positioned their apparatus, delaying their readiness to operate as the RIC. For the next several minutes, numerous transmissions occurred between three radio channels regarding the collapse, accounting for personnel, and requesting resources. The officer of LF27 instructed members from his crew (T27) to grab saws and enter the building to assist with search, rescue, and extrication efforts. This officer also advised the IC over the radio of what he was doing. At 0007 hours, the role of safety officer was assigned to BC11 who had arrived on scene earlier in the incident. The personnel accountability report quickly determined that the victim was missing and likely within the debris pile. At 0010 hours, the victim was discovered under a large section of the ceiling and appeared motionless (see Diagram 3). The victim was wearing his self-contained breathing apparatus and his facepiece was on his face. The victim’s upper body was pressed forward against his knees when he was discovered. Fire fighters quickly removed the victim from the debris pile and removed his facepiece to find him unresponsive and not breathing. Advance life support was immediately started on scene and continued while he was transported to a local hospital. Unfortunately, the victim died the next day. Diagram 3. Location of victim following the collapse. Local fire investigators believe the fire originated in the void space below the first floor fire place enclosure, adjacent to the blow out and control box assembly (see Photo 11). Fire then traveled upward in the void space above the fire place to the bottom side of the roof before traveling horizontally into the drop ceiling space above the living room. No fire stops had been installed. When the gas-burning fire place was installed, the manufacturer’s instructions and building codes were not followed, permits were not obtained, and the fire place(s) was never inspected by local building officials. Additional information regarding their investigative findings can be found within the fire department fire investigation report. Note: It is unknown if this report is available to the public. Photo 11. D-side exposure wall that was first observed showing fire by arriving units. Void space directly below fire place shows control box and charring to the combustible wood members. According to the coroner’s report death was due to sequelae of anoxic encephalopathy due to, or as a consequence of status post cardiorespiratory arrest following compression and restriction of the chest. Twelve individuals (fire fighters, operators, engineers, and captains) incurred injuries as a result of the interior ceiling collapse. These injuries included strains /sprains (back, neck, and extremities), contusions (back and neck), fractures (ankle), a cervical spine injury, and a concussion. Recommendation #1: Fire departments should be aware of potential hazards associated with ceiling and roof structural elements that have been exposed to fire or other factors for an extended period of time and acknowledge the potential for a collapse within a structure. Interior fire suppression crews need to act quickly in exposing concealed spaces such as walls, soffits, and drop ceilings so that the seat of a fire and its spread can be quickly contained and extinguished through coordinated water application. Opening up concealed spaces will also provide interior fire suppression crews a good view of structural/support components to assess its damage or instability, which will assist the fire department in making a decision to manage the fire offensively or defensively, to designate a safety officer, and/or whether or not to establish a collapse zone. Fire fighters need to be able to make critical decisions based on their knowledge, experience, and observations so that fire fighter health and safety is achieved. Recommendation #2: Fire departments should familiarize and train personnel on unique structures within their jurisdiction (e.g., hazards associated with hillside construction, building design, and modern interior construction). Discussion: A fire department’s familiarity with types of construction in their community is an important tool in safely fighting fires. Every structure, commercial or residential, has its own unique features and fire departments cannot rely solely on the last fire incident they participated in to provide them with a plan that will work at the next fire incident. Fire departments need to ensure that fire fighters, officers, and incident commanders have a sound knowledge base and experience that they can apply to any incident, while tweaking this plan to meet the changes of the incident at hand. This begins with an initial fire fighter recruit school or other type of training module(s), which will progress with additional training and experience gained through on-the-job training and/or individual walk-throughs during building constructions. Fire departments need to evaluate their response districts for unique or hazardous structures because the large residential home could pose just as many hazards as a commercial structure. During this incident, the fire department responded to an upper-class neighborhood that was situated on a hillside. The roads were narrow with parked cars on both sides, houses were built in close proximity to each other, and the street view of a residence did not provide responders with ample information for their size-up of the structure (e.g., subterranean floors, limited access to all sides of the structure). Structures on hillsides pose obstacles for fire departments to be aware of and possibly should be preplanned. Although not a factor in this incident, the fire department was also faced with the size of the structure (over 12,000 square feet) and limited access to subterranean floors. Additionally, this home and others in the neighborhood were of substantial square footage of living space. The home consisted of approximately 12,500 square feet over three floors which exceeds the square footage of many commercial buildings. As such, these types of homes require greater resources and different tactics than the typical residential property. This newer style home had an open floor plan for esthetic appeal. The ceilings were vaulted in areas with drop ceilings constructed of high quality and heavy grade materials, which posed obvious hazards to the fire fighters in this incident (e.g., reaching ceilings, opening ceilings and walls, and void spaces), as well as hidden hazards (e.g., fire damage to ceiling supports, water absorbed from insulation, construction type). These higher quality and heavier grade materials were used to construct the drop ceiling as if it were a single system. When it became exposed to fire and other fireground activities it eventually gave way, collapsing onto the area where the interior crews were working. This occurrence was not expected and should be evaluated on a lessons learned approach. Fire departments cannot rely on the structure to not collapse and should constantly be evaluating their fireground strategy and tactics and observing potential indicators of collapse (e.g., time exposed to fire, construction type, noises, and cracks). Fire departments should consider looking at architectural plans or walking through residential structures as they are being built to get a better understanding of how today’s homes are being constructed. Recommendation #3: Homeowners, contractors, and governing municipalities (federal, state, regional, and local) should ensure compliance with current building and fire codes found within their jurisdiction. Discussion: Homeowners and contractors should always consult with the manufacturer and understand manufacturer requirements before installing any type of appliance. They must also follow approved building plans and codes, obtain appropriate permits, and verify with the locality on whether an inspection is required by code officials. Municipalities must inspect all new construction, additions, renovations or remodeling for compliance to current codes (requirements vary state to state). Every effort should be made as new permits are issued to aggressively inspect a structure to verify that it meets current code requirements and that safety measures have not been cut to save money. Code inspections should specifically consider building information relevant to civilian and fire fighter safety (e.g., fire rated materials, fire stops, and sprinkler systems) and verify that the appropriate appliance(s) or system is properly installed and protected within a structure. During this incident, the fire place installation, in the area of fire origin, did not follow appropriate manufacturer’s installation requirements, local building codes, did not receive a permit, and was not inspected by local building code officials. Recommendation #4: Fire departments should ensure that a separate incident safety officer (ISO), independent from the incident commander, is appointed at each structure fire with the initial dispatch. According to NFPA 1500 Standard on Fire Department Occupational Safety and Health Program,10 as incidents escalate in size and complexity, the incident commander shall divide the incident into tactical-level management units and assign an incident safety officer (ISO) to assess the incident scene for hazards or potential hazards. These standards indicate that the incident commander is in overall command at the scene but acknowledge that oversight of all operations is difficult. Although, the presence of a safety officer does not diminish the responsibility of individual fire fighters and fire officers for their own safety and the safety of others, on-scene fire fighter health and safety is best preserved by delegating the function of safety and health oversight to the ISO. NFPA 1521 Standard for Fire Department Safety Officer defines the role of the ISO at an incident scene and identifies duties such as recon of the fireground and reporting pertinent information back to the incident commander; ensuring the department’s accountability system is in place and operational; monitoring radio transmissions and identifying barriers to effective communications; and ensuring established safety zones, collapse zones, hot zones, and other designated hazard areas are communicated to all members on scene.11 The ISO adds a higher level of attention and particular expertise in analyzing safety hazards, building construction, fire conditions, and the particular uses and/or limitations of protective equipment.3 Larger fire departments may assign one or more full-time staff officers as safety officers who respond to working fires. In smaller departments, every officer should be prepared to function as the ISO when assigned by the incident commander. When the designated ISO is not immediately dispatched or available at the scene, the IC should appoint an ISO. Line officers should receive sufficient training to act as an ISO where needed, until the designated ISO arrives on scene. This will ensure the presence of an ISO on the fireground at all times. The ISO should also be added to the first alarm of a reported fire and for additional incidents that the fire department determines as necessary. Also, an ISO plays an important role during a post Mayday situation, such as what occurred at this incident. A structural collapse means remaining structural elements remain severely compromised. Further, fire fighters will be searching and rescuing “one of their own” and will push or exceed the safety envelope of risk. In such situations, an ISO must be assigned to the search area to assess the risk and ensure a reasonably safe operation. Additionally, the incident commander relies upon fire fighters and the ISO to relay feedback on fireground conditions in order to make timely, informed decisions regarding risk versus gain and offensive-versus-defensive operations. The use of an ISO at this incident could have assisted in determining potential collapse within the home, readying personnel for RIC operations, and providing the IC with a set of mobile eyes while walking around the fireground. The safety of all personnel on the fireground is directly impacted by clear, concise, and timely communications among mutual aid fire departments, sector command, the ISO, and the incident commander. Recommendation #5: Fire departments should ensure that a rapid intervention crew (RIC) is readily available and prepared to respond to fire fighter emergencies. During this incident, no RIC was established prior to the ceiling collapse. An arriving engine company was placed into this roll. This crew had to navigate on foot up a hill in order to reach the incident scene. Recommendation #6: Fire departments should ensure that crew integrity is maintained at all times during an incident, especially during and following any emergency traffic or Mayday. As the incident escalates, additional staffing and resources may be needed, adding to the burden of tracking personnel. At this point, an accountability system should be in place, including an incident command board that is established and maintained by an assigned accountability officer or aide. A properly maintained incident command board allows the IC to readily identify the location and time of all fire fighters on the fireground. As a fire escalates and additional fire companies respond, a chief’s aide or accountability officer assists the IC with accounting for all fire fighting companies at the fire, at the staging area, and at the rehabilitation area. A properly initiated and enforced accountability system on every response, which is consistently integrated into fireground command and control, enhances fire fighter safety and survival by helping to ensure a more timely and successful identification and rescue of a disoriented or downed fire fighter. Fire departments should be aware of the 2010 International Association of Fire Chiefs’ (IAFC) Rules of Engagement (ROE) of Structural Firefighting.13 The 2010 IAFC ROE of Structural Firefighting states, “Go in together, stay together, come out together.”13 These guidelines also recommend that the IC ensure accurate accountability of every fire fighter’s location and status. During this incident, personnel assigned themselves to interior RIC operations following the collapse without being assigned by the IC. This included fire fighters arriving on scene and personnel originally assigned to operations at the incident. Recommendation #7: Fire departments should consider all resource needs and SCBA air consumption rates in action planning during firefighting operations. Discussion: The incident commander should maintain situational awareness of additional resource needs based on building size and fire conditions and how SCBA air consumption will affect resource needs. Shortly after arriving on scene (2331 hours), the battalion chief assuming command asked the interior company (E41) if additional resources were needed. At 2339 hours, the IC advised dispatch that they would handle the incident with available resources on scene. At 2344 hours E41 advised the IC that there was no change in fire conditions and they still had a fair amount of fire in the walls. Over the next 18 minutes, leading up to collapse, numerous reports were communicated to the IC that the fire was still active and moving south in the attic/ceiling space. T27 also was experiencing heavy smoke conditions on the roof requiring fire fighters to go on SCBA air. The chain saws were bogged down by heavy, thick smoke to the extent that the saw’s air cleaners had to be removed. At 2354 hours, the IC requested an additional Task Force as all his companies from the initial dispatch were now committed. LF20 and E61 were dispatched. None of these fire companies had arrived on scene at the time of collapse. The common accepted practice where all companies are committed and fire crews have not obtained fire control is to request an additional alarm that matches the resources of the first alarm. This allows the IC to have fresh crews available to replace crews that are depleting their SCBA air supply and to keep uncommitted companies in staging as backup. This department utilized 4,500 psi “45 minute” SCBA units. Under the typical workload of fire fighters operating at a fire, the actual life expectancy of this SCBA unit is 20-25 minutes. At 2358 hours, 27 minutes after T27 arrived on scene, and while operating on the roof, T27 advised the IC that they were leaving the roof to replace depleted SCBA bottles signaling that all crews would shortly also be in need to exit the fire building to replace depleted SCBA bottles. At the time of collapse, interior crews were nearing depletion, or out of air, and would not have adequate air remaining to conduct effective search and rescue operations for trapped fire fighters. The IC must insure that adequate resources are on scene to replace exiting fire crews. Additionally, the commonly recommended practice when a Mayday is declared for a fire fighter experiencing a life threatening emergency is for the IC to immediately declare an additional alarm that matches the initial assignment. The purpose of this requested resource is to provide resources to attack the fire and protect the search area, as well as, provide additional resources for search and rescue operations. At the time of collapse, all first alarm companies were committed to fire operations and E61 was approaching the scene. Once on scene, they had to park their apparatus down the street and maneuver on foot to the Mayday location in the building. In addition to the victim, twelve firefighters were also injured. Recommendation #8: Fire departments should ensure that adequate staffing is available to respond to emergency incidents. Life hazard to the populace protected. Provisions of safe and effective fire-fighting performance conditions for the fire fighters. Nature, configuration, hazards, and internal protection of the properties involved. The NFPA standard states that both engine and truck companies shall be staffed with a minimum of four on-duty personnel. The standard also states that companies shall be staffed with a minimum of five or six on-duty members in jurisdictions with tactical hazards, high-hazard occupancies, high incident frequencies, geographical restrictions, or other pertinent factors identified by the authority having jurisdiction. During this incident, according to the initial dispatch records, it took approximately 8 minutes for the first arriving engine company to get on scene and 18 minutes for the last unit to arrive. It took B18 (the IC) approximately 11 minutes to get on scene from the initial dispatch. These units were not assigned to other incidents and response times may have been affected due to the fire department’s modified coverage plan. Dunn V . Collapse of burning buildings, a guide to fireground safety. Saddle Brook, NJ: PennWell. Klaene BJ, Sanders RE . Structural fire fighting. Quincy, MA: National Fire Protection Association. Dodson D . Fire department incident safety officer. 2nd edition. New York: Delmar Publishers. NIOSH . NIOSH alert: preventing injuries and deaths of fire fighters due to structural collapse. Cincinnati, OH: U.S. Department of Health and Human Services, Centers for Disease Control and Prevention, National Institute for Occupational Safety and Health, DHHS (NIOSH) Publication No. 99-146. NIOSH . Career fire fighter dies and chief is injured when struck by 130-foot awning that collapses during a commercial building fire – Texas. Morgantown, WV: U.S. Department of Health and Human Services, Centers for Disease Control and Prevention, National Institute for Occupational Safety and Health FACE Report F2007-01. Brannigan FL . Building construction for the fire service. 3rd edition. Quincy, MA: National Fire Protection Association. Endsley MR, Garlan J. Situational awareness analysis and measurement. Mahwah, NJ: Lawrence Erlbaum Associate. NFPA . NFPA 1561 standard on emergency services incident management system. 2008 ed. Quincy, MA: National Fire Protection Association. NFPA . NFPA 1500 standard on fire department occupational safety and health program. 2007 ed. Quincy, MA: National Fire Protection Association. NFPA . NFPA 1521 standard for fire department safety officer. 2008 ed. Quincy, MA: National Fire Protection Association. IFSTA . Essentials of fire fighting. 5th ed. Stillwater, OK: Fire Protection Publications, International Fire Service Training Association. NFPA . NFPA 1710 standard for the organization and deployment of fire suppression operations, emergency medical operations, and special operations to the public by career fire departments. 2010 ed. Quincy, MA: National Fire Protection Association. This incident was investigated by Stacy C. Wertman, Safety and Occupational Health Specialist and Matt E. Bowyer, General Engineer with the Fire Fighter Fatality Investigation and Prevention Program, Surveillance and Field Investigations Branch, Division of Safety Research, NIOSH located in Morgantown, WV. Tom Pouchot, NIOSH General Engineer, National Personal Protective Technology Laboratory, conducted an evaluation of the victim’s SCBA. An expert technical review was provided by Fire Chief Gary Morris (retired). A technical review was also provided by the National Fire Protection Association, Public Fire Protection Division. As part of the National Institute for Occupational Safety and Health (NIOSH) Fire Fighter Fatality Investigation and Prevention Program, the Technology Evaluation Branch (TEB) agreed to examine and evaluate one SCBA identified as the Survivair (Sperian Respiratory Protection LLC) model Warrior, 4500 psi, 45-minute, self-contained breathing apparatus (SCBA). This SCBA status investigation was assigned NIOSH Task Number 17690. The California Fire Department was advised that NIOSH would provide a written report of the inspections and any applicable test results. The SCBA, contained within a corrugated cardboard box, was delivered to the NIOSH facility in Bruceton, Pennsylvania, on March 3, 2011. After its arrival, the package was taken to building 20 and stored under lock until the time of the evaluation. The package was opened in the Respirator / SCBA Evaluation Lab (Building 37) and a complete visual inspection was conducted by Eric Welsh, Engineering Technician, NPPTL. The SCBA was inspected on May 16, 2011 and was designated as Unit #1. This SCBA was examined, component by component, in the condition as received to determine the conformance of the unit to the NIOSH-approved configuration. The visual inspection process was documented photographically. The SCBA was identified as the Survivair model Warrior, 45 minute, 4500 psi unit, NIOSH approval number TC-13F-0571CBRN. The unit data logger was downloaded by Sperian Respiratory Protection personnel prior to being shipped to NIOSH and the downloading was witnessed by members of the Fire Department. The data logger information was supplied to NIOSH by the Fire Department and included for information purposes only. The complete SCBA inspection is summarized in Appendix I (of the complete report).The condition of each major component of the SCBA that were photographed with a digital camera is contained in Appendix III (of the complete report). It was judged that the unit could be safely pressurized and tested with a replacement cylinder. The replacement cylinder was supplied by the Fire Department. Unit # 1 was tested on May 31 and June 2, 2011. Appendix II (of the complete report) contains the complete NIOSH and NFPA test reports for the SCBA. Tables One and Two summarize the NIOSH and NFPA test results. Also attached in Appendix II (of the complete report) are the results of the download of the SCBA data logger. The data was downloaded by personnel from Sperian Respiratory Protection and witnessed by members of the Fire Department. A SCBA was submitted to NIOSH by the Fire Department for evaluation. The SCBA was delivered to NIOSH on March 3, 2011. The SCBA unit was inspected on May 16, 2011. The unit was identified as a Survivair model Warrior, 4500 psi, 45-minute, SCBA (NIOSH approval number TC-13F-0571CBRN). The unit suffered very minimal damage, exhibited slight signs of wear and tear, some foreign material was present on parts of the unit but the SCBA unit was generally in good condition. The cylinder valve as received was in the closed position and the cylinder gauge read approximately 0 psig. The regulator and facepiece mating and sealing areas on the unit were clean. The sealing o-ring between the regulator and facepiece was missing. Some debris was present on the inside of the facepiece. The harness webbing on the unit was in good condition with no fraying or tears. The PASS device on the unit did function and the device functioned properly. The NFPA approval label on the unit was present and readable. Visibility through the lens of the unit facepiece was good, but the lens had some minor scratches. The air cylinder on the unit had a manufactured date of 9/00. Under the applicable DOT-E-10915-4500 exemption, the air cylinder is required to be hydro tested every 5 years, starting on or before the last day of September, 2005. A hydro requalification label was present but no date was apparent. Therefore it was not determined if the cylinder was in hydro certification when last used. The unit cylinder was in fair condition with some dirt and slight damage present. A replacement cylinder that was included with the unit was utilized for all testing. No other maintenance or repair work was performed on the unit at any time. The SCBA unit did not meet the requirements of the NIOSH Positive Pressure Test and the Rated Service Time Test, as the unit facepiece pressure did not stay positive and the unit did not meet the required 45 minute rated service time during the rated service time test. The unit met the requirements of all of the other NIOSH tests. The unit did pass the NFPA flow test. In light of the information obtained during this investigation, NIOSH has proposed no further action on its part at this time. Following inspection and testing, the SCBA was returned to storage pending return to the Fire Department. The unit data logger was downloaded by Sperian prior to being shipped to NIOSH. The data logger information was forwarded to NIOSH by the Fire Department.